Red-headed Woodpeckers are Cavity Nesting Birds. They are primary cavity nesters, excavating their own nesting cavity usually in a dead tree. But on rare occasions they will nest in a Nest Box (AKA bird house). Red-headed woodpeckers are at home in open country with a few widely spaced trees. They can also be found in forest edges but avoid heavily wooded areas. In the fall/winter they are attracted to oak and hickory woodlands as they cache the nuts and eat them during winter. During warmer seasons they hunt for insects in trees but also will catch insects by flycatching from a perch. insects on the ground will also be taken by hopping on the ground to catch them. 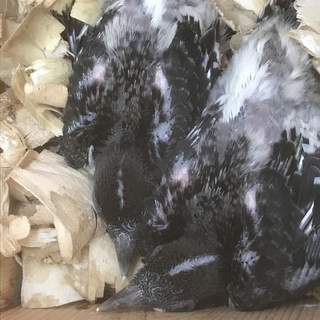 Encourage red-headed woodpeckers to nest by providing dead trees in open county for nesting and by putting up some Nest Boxes designed for red-headed woodpeckers. It's imperative that you control European Starlings as they will evict red-headed woodpeckers from nest sites. If you have red-headed woodpeckers in your area, putting up a few red-headed woodpecker nest boxes may entice them to nest. Nest Box Design gives detailed information on building this nest box as well as others. 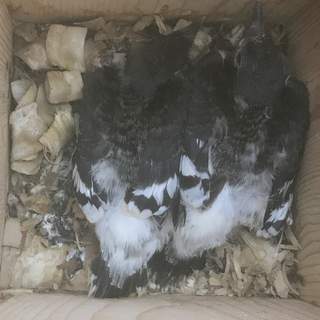 But putting up a nest box will more than likely also attract European Starlings, an introduced invasive species that competes negatively with red-headed woodpeckers. 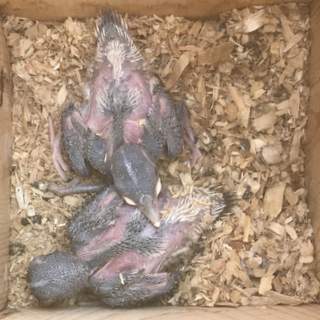 Before you decide to put up a nest box for red-headed woodpeckers, you must commit to preventing European starlings from nesting in your nest boxes. They will destroy the eggs and nestlings of the red-headed woodpeckers. 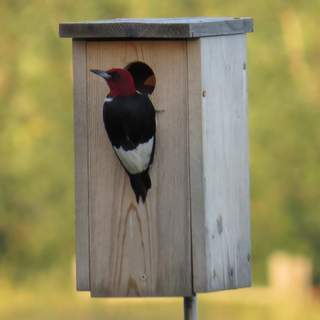 I've tried a few sized nest boxes for red-headed woodpeckes and the box they nested in was 5 1/2" x 6" floor size. The box was made from white pine boards, which are smooth on all surfaces. The box can be monitored by opening the roof. The front opening design allows for nest box traps to be inserted as well. 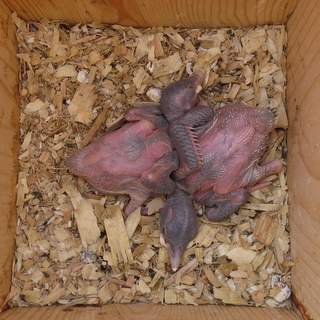 Nest Box Traps are used to trap competing European Starlings. Red-headed woodpeckers prefer a nest box that is mounting at least 10' high in an open area with few to no trees. A much better technique is to mount the box on a telescoping pole. This allows the box to be be lowered and monitored. It's important to locate the nest box in an open area with a clear flight path to the box. Do not mount it in an area with tree limbs that overhang the nest box either as that gives predators another point of access. Red-headed woodpeckers are birds of open country. Do not mount nest boxes in heavily wooded areas unless it is on the edge of a wooded area. The European Starling is an invasive non-native bird species that competes negatively with our cavity nesting native birds for nest sites. Like the red-headed woodpecker, they are a cavity nesting bird. They are not protected in North America. They can be trapped and eliminated legally. They will destroy the nests and nestlings of red-headed woodpeckers as well as other native cavity nesting birds. Even if they don't destroy the nest, they will drive the nesting red-headed woodpeckers away from their nest. They are extremely aggressive birds when seeking a nesting site. European Starling Control details methods of trapping European Starlings. You must commit to trapping them to prevent them from competing with red-headed woodpeckers as well as other native cavity nesting birds. It's counterproductive to put up a nest box and allow European starlings to nest in it. House Sparrows are also non-native birds that compete aggressively with our native birds. House Sparrow Control details methods of trapping house sparrows. 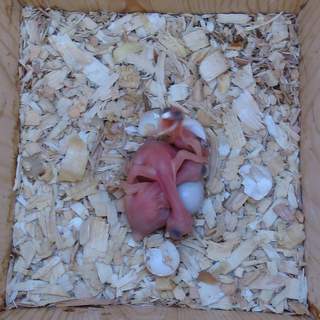 A pair of red-headed woodpeckers nested in a nest box. 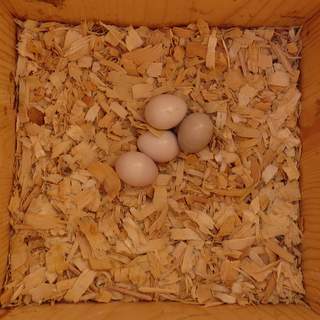 They laid five eggs, three of which hatched. Two chicks survived to fledge from the box. This pair of red-headed woodpeckers nested at our farm near Mitchell, South Dakota. Jul 1: I noticed a pair of red-headed woodpeckers going in and out of 3 different boxes that were within about 10 feet of each other. The boxes were mounted on conduit which was mounted on posts of a cattle lot. The boxes are at least 10 feet off the ground. There are two mature Siberian elm trees located about 20 feet away. There are no trees in all directions except the elms and other trees further west. The entrances face west. Since the woodpeckers like to excavate their nesting sites I filled the boxes half full of aspen shavings. Jul 6: I checked all three boxes and found that all three had most of the aspen shavings excavated. There were no eggs. Jul 17: There are FIVE eggs in the south nest box. So excited. Red-headed woodpeckers are actually nesting in the front yard on the farm. Jul 23: One of the five eggs has disappeared. More than likely a house wren removed it. There are many house wrens. 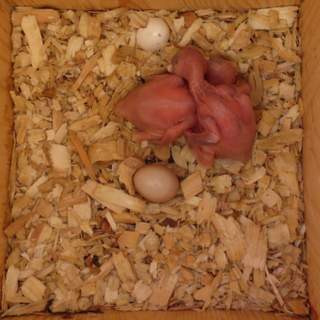 One egg is gray and is probably not going to hatch. Jul 26: There are three chicks. One is about half the size of the other two. I assume that was the last egg that was laid. Jul 29: The smallest chick is gone. I assume it was the house wren as I had seen a small bird enter the house at one point. The other two chicks have grown! Aug 2: One of the chicks has his eyes open. Aug 5: The chicks continue to grow and are partially feathered. Aug 10: I'm amazed how fast they grow. They now are fully feathered. Their rumps are white and they have a white median crown stripe. Aug 13: The chicks look like they could fly now. I think monitoring should cease. Aug 18: The parents are still going to the box and feeding the chicks. Aug 22: There is still activity at the box. Aug 27: There is no activity at the box. Upon opening the box it is found to be empty. The chicks have fledged. The young birds are seen in the elm tree. Interestingly the box was devoid of aspen shavings. I wonder if the parents were forced to remove them all because the chicks pooped so much.